Data incompleteness in pharmacovigilance (PV) health records limits the use of current causality assessment methods for drug-induced liver injury (DILI). In addition to the inherent complexity of this adverse event, identifying cases of high causal probability is difficult. The aim was to evaluate the performance of an improved, algorithmic and standardised method called the Pharmacovigilance-Roussel Uclaf Causality Assessment Method (PV-RUCAM), to support assessment of suspected DILI. Performance was compared in different settings with regard to applicability and differentiation capacity. A PV-RUCAM score was developed based on the seven sections contained in the original RUCAM. The score provides cut-off values for or against DILI causality, and was applied on two datasets of bona fide individual case safety reports (ICSRs) extracted randomly from clinical trial reports and a third dataset of electronic health records from a global PV database. The performance of PV-RUCAM adjudication was compared against two standards: a validated causality assessment method (original RUCAM) and global introspection. The findings showed moderate agreement against standards. The overall error margin of no false negatives was satisfactory, with 100% sensitivity, 91% specificity, a 25% positive predictive value and a 100% negative predictive value. The Spearman’s rank correlation coefficient illustrated a statistically significant monotonic association between expert adjudication and PV-RUCAM outputs (R = 0.93). Finally, there was high inter-rater agreement (K w = 0.79) between two PV-RUCAM assessors. Within the PV setting of a pharmaceutical company, the PV-RUCAM has the potential to facilitate and improve the assessment done by non-expert PV professionals compared with other methods when incomplete reports must be evaluated for suspected DILI. Prospective validation of the algorithmic tool is necessary prior to implementation for routine use. The online version of this article (doi: 10.1007/s40264-017-0541-2) contains supplementary material, which is available to authorized users. The research leading to these results has received support from the Innovative Medicines Initiative Joint Undertaking under grant agreement n° 115003, the resources of which are composed of financial contributions from the European Union’s Seventh Framework Programme (FP7/2007-2013) and EFPIA companies, in kind contribution. The first author was funded as a Novartis associate during the execution of this work. No other sources of funding were used to assist in the preparation of this study. David Lewis has no conflicts of interest that are directly relevant to the content of this study. Dr Lewis is a full-time employee of Novartis Pharmaceuticals AG, Basel Switzerland. Dr Lewis holds shares in Novartis and GlaxoSmithKline, and has options on Novartis stock. Statement regarding conflicts of interest: ‘This publication has not been influenced or amended as a result of my employment or my shareholdings or stock options. I affirm that the content of the draft is scientific, evidenced-based, current and is not subject to bias.’ Christoph Meier has no conflicts of interest that are directly relevant to the content of this study. Henk Johan Streefkerk has no conflicts of interest that are directly relevant to the content of this study. Dr Streefkerk is a full-time employee of Novartis Pharmaceuticals AG, Basel Switzerland. Dr Streefkerk has options on Novartis stock. Michael Merz has no conflicts of interest that are directly relevant to the content of this study. Dr Merz is a full-time employee of Novartis Institutes for BioMedical Research, Basel, Switzerland. Erik Scalfaro has no conflicts of interest that are directly relevant to the content of this study. Mr Scalfaro was an associate of Novartis Pharmaceuticals AG, Basel Switzerland. FDA. Guidance for Industry: Drug-induced liver injury: premarketing clinical evaluation. 2009; http://www.fda.gov/downloads/Drugs/…/Guidances/UCM174090.pdf. Accessed 06 Jul 2016. United States National Institute of Diabetes and Digestive and Kidney Diseases (NIDDK) -. LiverTox, clinical and research information on drug-induced liver injury. https://livertox.nih.gov/drugliverinjury.html. Accessed 26 Jun 2016.
International Conference on Harmonisation. 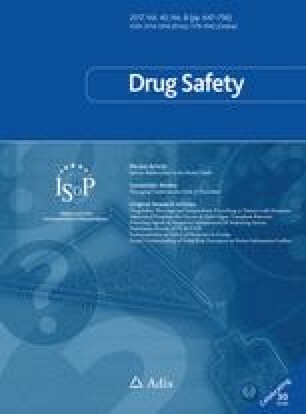 ICH harmonised tripartite guideline post-approval safety data management: definitions and standards for expedited reporting E2D. 2003; https://www.ich.org/fileadmin/Public_Web_Site/ICH_Products/Guidelines/Efficacy/E2D/Step4/E2D_Guideline.pdf. Accessed 18 Jan 2016.